(CNN) -- Richard Rose used to challenge his wife, Joyce, if he thought she was misstating something, but these days he lets it go. 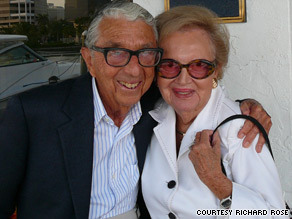 Richard Rose, here with his wife, Joyce, says he feels happier now that he has retired. At age 87, he's found that as people get older, they tend to "mellow out" when it comes to arguments. Nowadays, devoting time each day to swimming and reading, Rose feels happier than he did in his 40s. "As you get older, if you're wise, you avoid all stress," said Rose, who is retired and lives with his wife in Palm Beach, Florida. Rose's experiences reflect findings presented over the weekend at the annual meeting of the American Psychological Association in Toronto, Canada. Researchers suggested that, generally, people in their 80s and 90s are happier than younger people. "Older people are better able to recognize what will bother them, and better able to negotiate their environment," said Susan Turk Charles, a psychologist at the University of California, Irvine. People ages 80 and older are the fastest-growing portion of the population in many countries, according to a recent report from the U.S. Census Bureau. Globally, this age group will grow 233 percent between 2008 and 2040, while the total population will increase 33 percent in the same time period, the report said. A Pew Research Center study found that the happiest men are ages 60 to 69, while the least happy are ages 20 to 29. Several studies have found that older adults report fewer negative emotional experiences and greater emotional control than young adults do, Charles said. In depth: Why Do I Do That? While older adults seem to be happier on the balance, that does not mean they are enthusiastic all the time, Charles said. The research strongly indicates that older people feel less negative emotion -- anxiety, sadness and anger, for example -- than younger people, but is less clear about whether positive emotion -- such as feelings of contentment, enthusiasm and pride -- increases with age. Emotional well-being is relatively well-preserved among the oldest adults, Charles said in a recent paper. She and psychologist Laura Carstensen of Stanford University, who also presented at the conference, suggest that this is because older adults may better regulate their emotions. For example, older adults may avoid negative experiences or limit their exposure to stressful situations more than younger people do. Also, older adults mostly interact with close friends and family members, instead of new friends or acquaintances. This fits in with the idea that using established social connections brings about more positive social experiences and increased well-being, part of a concept called socioemotional selectivity theory. Older adults who are retired do not have exposure to stressful work situations, Charles wrote in a recent paper. Rose recalls that when he was in his 40s and running an office furniture and design store in Cleveland, Ohio, "Every day, there was a crisis, minor or major," he said. He would have difficulty sleeping, as well as digestive problems. "Since I retired, I have none of those problems. I sleep well and I eat well," he said. "The stress of business always took something out of me." The way people treat their elders -- for instance, a young person may be less likely to argue with an older relative than with a sibling -- may also contribute to this phenomenon of decreased negative emotions in old age, Charles said. Studies have also shown that older adults limit the time they spend thinking about the negative aspects of a situation, and focus on the positive aspects more than younger adults. Memory may also contribute to older adults' positive mindset, studies show. Older adults tend to recall negative emotional experiences from the past as less intense, and think of memories more positively in general, regardless of how much time has passed since the event, Charles said. "Older people still remember things more positively, regardless of how much time has passed," she said. As for the stereotype that old people are grouchy, Charles says that someone who behaves this way was probably not so pleasant to be around at age 20. There is a difference between emotional state and personality, research shows, and certain personality traits do persist over time. "The most neurotic person in your high school will be the most neurotic at the 50th reunion," she said. At age 86, Annie Ross of Jonesboro, Georgia, says she also feels happier now than in her younger years. Having retired more than 20 years ago, she now has more time to go to church and read the Bible, and her strengthened religious connection has made her feel "more joyful." She enjoyed her job as a contract administrator with the U.S. Department of Defense, and felt happy then. "But now I am happier because I know more about the meaning of happiness and joy and rejoicing," she said. One lesson from looking at how older people achieve emotional stability is that not every battle needs to be fought, Charles said. Sometimes it is better to let an argument slide rather than dwell on it, or to avoid confrontation, she said. But younger people's generally high-strung, less-content nature is not necessarily a problem, Charles said. Successful careers often require long hours and stress, and dating is not all fun, she said. "Sometimes, happiness is something that you might not be able to achieve in the same way when you're young and you have these things to accomplish," she said. "Your time will come." Rose's advice is to stay mentally active; for example, by reading and keeping up with politics. "All I can say is if you're fortunate enough to be able to retire early, or if you love working and continue working, just try to avoid stress points," he said. Also, he added, "I believe firmly in exercise."